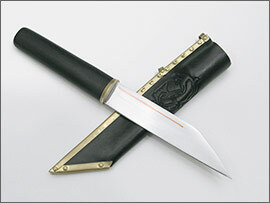 Posted: Mon 02 Aug, 2010 12:14 am Post subject: Contest: Back-breaking Seax! 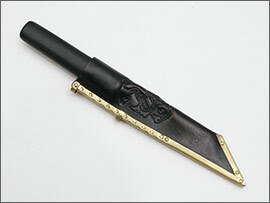 We are giving away a broken back seax generously donated by Elchon's Workshop. Michal Plezia of Elchon's Workshop gave us a handmade one-of-a-kind broken back seax so that we could have this contest and give it away to a lucky myArmoury.com member! The forged and ground steel blade has three different metals inlaid into it: twisted brass and silver on one side and copper on the other. A brass bolster and grip of grenadilla wood complete the seax. It also comes with a molded brown leather sheath tooled with a zoomorphic design. More information about this piece can be found in our hands-on review by Chad Arnow. Please take a moment to visit the Elchon's Workshop Web site and see more of Michal's wares. Give him a big thanks for donating this prize! Contest entry is open until Monday September 6, 2010. Very nice work and it would fill a gap in the collection as I don't have an actual seax although I do have a custom but modern blade of my design that could be considered " seax - like " in blade profile. And a few bowie knives that, although not seaxs, do fill the same design niche but of a different time and culture ( Good design ideas seem to repeat over time and place ) . Very nice of Michal Plezia to support this site with the gift of his work, and my thanks even if I don't win this one. I'd like to add my thanks to Michal for making this donation. Having had this sax in my hands I can tell you it's a nice, solid, attractive piece of work. The winner will be pleased. Ah, so nice to give a nod to old-time members - even though I've been lurking for long periods of time. I love these contests! Thanks to Michal for the donation and thanks to myArmoury for running another cool giveaway! I want to thank Chad and Nathan. Without their hard work it wouldn't be possible. My chances are slim, but as the SAS says "who dares wins." Very generous of you Michal and a very nice piece of work. I just finished reading Chad's review of the piece, and I really like it. Kudos for offering this in a contest. Hey, only 200 entries so far. That means the odds of winning are pretty good for you guys! Then again, it's only been a few days but I figured I'd bump this up and get more to enter. I figured I'd bump this up and get more to enter. As a low-posting "medium timer" here, I was hopeful we could keep this quiet after I registered to win. In all seriousness; this is a great gesture by Michal, a fine weapon anyone would be proud to own, and yet another reason why myArmoury is a premier forum. I appreciate the thanks, though I feel strange about being singled out or put in that company. Nathan dreamed this place up and makes it run. I just referee when needed. Personally, what makes this place cool are the people who participate: people who ask interesting questions and/or provide interesting answers, those who write articles, those who donate their time, knowledge, experience, and their wares, and so many more. This site's greatness has everything to do with those people. I just enjoy being part of it all. Well against my own best interest I'm also bumping up the Topic. The contest may be weighted to give us old " veteran " longtime members better odds of winning than fresh new members but you guys also have a chance of winning, so don't be shy to participate. i'm glad i didn't miss this contest i always wanted a seax but hey if i don't win the more important is to particippate right? This is just a reminder that we have this contest for a free custom one-of-a-kind knife. It's been donated by Elchon's Workshop and we're giving it away for free. Enter now for your chance to win. See the first post in this topic for instructions. Posted: Tue 10 Aug, 2010 8:24 pm Post subject: I entered! C'est Vrai! Nyaahahahaah! Now you've got a girl chasin' after that gorgeous piece of viking weaponry. My hubby would love it. He comes from fine Norwegian stock. Many thanks to Elchon's Workshop for the donation. And may the best collector win! Only about three more weeks left in this contest until the winner is chosen! It's free to enter without any obligations. Go for it. Another contest will follow very quickly after... and then maybe another.